Gorilla Milk was instant breakfast. Carnation Instant Breakfast is known as Carnation Breakfast Complete. Not much after this came out, Pillsbury came out with Gorilla milk, which I thought was richer and creamier, and of course, Carnation still has its Instant Breakfast products. I use to buy them at the A&P food store on Easton in Wellston,Mo. 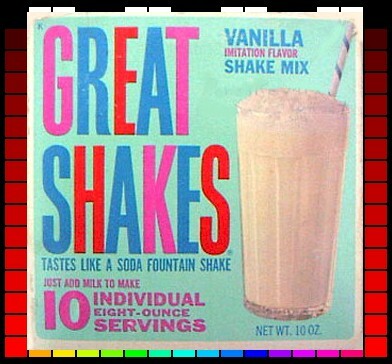 in the late sixties You could buy the box with a plastic shaker cup with a lid,includeing some envelopes,I don't remember how many.After you had the shaker then you could just buy the refills of ten envelopes in a box.The shakes were dark brown in color and the lids were tan in color.The shakers were thick plastic,so unless you handle them rough they would last a long time.I always bought the choclate favor ones.I really loved them.When you pour them into a glass they not only tasted like a milk shake,they also looked like one.I tell you,in all truthfulness,they were GREAT!! Thanks for mentioning Thick 'n' Frosty. I've added it to the gallery, but had a really hard time locating a photo. I finally found a commercial for it on YouTube, and used a screen-shot from that. Loved the chocolate flavor!! A few years later, Birds Eye came out with Thick n Frosty--frozen milkshake mix in chocolate, vanilla, and strawberry. They faded out in the seventies, if I remember right.